Exxon Mobil Corporation has reported earnings of $20.8 billion for last year,compared with $19.7 billion a year earlier, mainy due to its continued focus on long-term fundamentals and portfolio improvements. Announcing the 2018 results, Exxon Mobil said excluding US tax reform and asset impairments, earnings were $21 billion, compared with $15.3 billion in 2017. Cash flow from operations and asset sales stood at $40.1 billion, including proceeds associated with asset sales of $4.1 billion. Capital and exploration expenditures were $25.9 billion, including incremental spend to accelerate value capture, said the company in a statement. Fourth quarter 2018 earnings were $6 billion, or $1.41 per share assuming dilution, compared with $8.4 billion in the prior-year quarter, it added. The US oil giant said earnings excluding US tax reform and impairments were $6.4 billion, compared with $3.7 billion in the prior-year quarter. “Strong results during a period of commodity price volatility demonstrate ExxonMobil’s ability to deliver superior cash flow in different market environments,” said Darren W. Woods, chairman and chief executive officer. •Crude prices weakened in the fourth quarter, while natural gas prices strengthened with higher LNG prices and increased seasonal demand. •Natural gas volumes were supported by stronger seasonal gas demand in Europe. •Permian unconventional production continued to ramp up in the fourth quarter, with production up more than 90 percent from the same period last year. •Industry fuels margins weakened during the quarter due to lower seasonal gasoline demand and increased supply. •The company captured benefits from North American crude differentials with its integrated logistics and manufacturing capabilities. •Overall reliability remained strong during a quarter with higher levels of scheduled maintenance activity. •Chemical margins weakened during the quarter with lengthening supply from recent capacity additions. •Sales growth from investments resulted in the highest annual volumes in over ten years. •Turnaround activities were completed at the Singapore chemical plant during the fourth quarter. 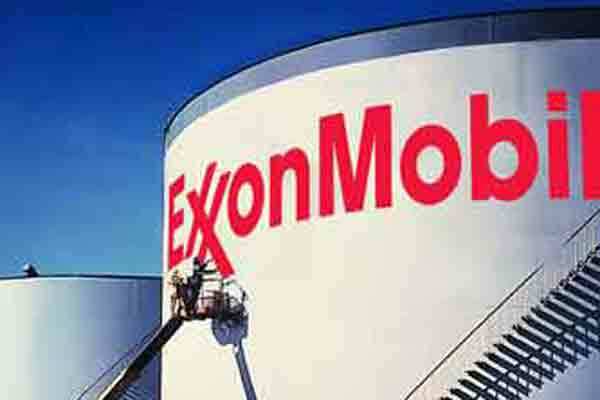 •ExxonMobil made its tenth discovery offshore Guyana and increased its estimate of the discovered recoverable resource for the Stabroek Block to more than 5 billion oil-equivalent barrels. •ExxonMobil subsidiary Esso Italiana completed its sale of the Augusta refinery, three fuel terminals in Augusta, Palermo and Naples, and associated pipelines to Sonatrach Raffineria Italiana S.r.l. ExxonMobil will continue to serve the Italian market, where it has operated for more than 125 years, with high-performance products, including Esso fuels and Mobil lubricants. •The company generated full-year cash proceeds from asset sales of $4.1 billion, slightly above the previous 5-year average of $3.3 billion. •ExxonMobil made a final investment decision to develop the West Barracouta gas field in Bass Strait to bring new gas supplies to the Australian domestic market. The project, located in the VIC/L1 Block offshore Victoria, is part of the company’s continuing investment in the Gippsland Basin and will be tied back to the existing Barracouta infrastructure offshore in Bass Strait. •Mozambique Area 4 co-venture participants, including ExxonMobil, secured liquefied natural gas (LNG) offtake commitments from the partners’ affiliated buyer entities, a key milestone enabling a rapid move toward a final investment decision in 2019 on the first phase of the Rovuma LNG project. Those commitments are subject to the conclusion of fully-termed agreements and the approval of the government of Mozambique. •The company commenced operations of a new coker unit at its Antwerp refinery in Belgium to convert heavy, higher-sulfur residual oils into high-value transportation fuels such as marine gasoil and diesel. The new 50,000 barrel-per-day unit expands the refinery’s capacity to meet demand for cleaner transportation fuels throughout northwest Europe.